Word Origin: Formerly Ns, Nielsbohrium. Named in honor of Niels Bohr. Sources: Bohrium is a man-made element. In 1976, Soviet scientists at Dubna announced they had synthesized element 107 by bombarding Bi-204 with heavy nuclei of Cr-54. There are reports that the element was ‘glimpsed’ for 2/1000 s in 1975. Bohrium was produced by bombarding a rapidly rotating cylinder target, coated with a thin layer of bismuth metal, with a stream of tangentially fired Cr-54 ions. 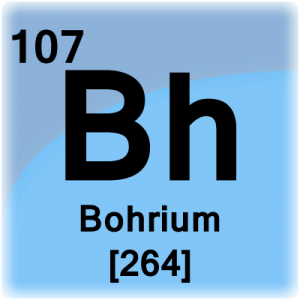 West German physicists at the Heavy Ion Research Laboratory at Darmstadt verified the existence of element 107, creating and identifying six nuclei of Bohrium.